13 | November | 2008 | can i just finish my waffle? 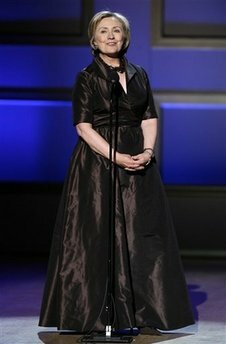 Hillary Clinton attended the Glamour Women of the Year Awards wearing not a pantsuit, but a chocolate brown Isaac Mizrahi gown. Oh, my. She shoulda’ just gone to Target. NEW YORK (AP) – MSNBC was the victim of a hoax when it reported that an adviser to John McCain had identified himself as the source of an embarrassing story about former vice presidential candidate Sarah Palin, the network said Wednesday. David Shuster, an anchor for the cable news network, said on air Monday that Martin Eisenstadt, a McCain policy adviser, had come forth and identified himself as the source of a Fox News Channel story saying Palin had mistakenly believed Africa was a country instead of a continent. Martin Eisenstadt doesn’t exist. He is a hoax. They were so thrilled to repeat a negative story on Sarah Palin, that they didn’t care, they didn’t vet the source. MSNBC has been the long arm of the Obama campaign for the entire election season so they are more than happy to report this stuff as hard news. Once you lose your objectivity and go all out for one candidate, it is not much of a stretch to accept any story or any source out there. The hoax was limited to the identity of the source in the story about Palin—not the Fox News story itself. While Palin has denied that she mistook Africa for a country, the veracity of that report was not put in question by the revelation that [Martin] Eisenstadt is a phony. Here they still want to cling to the chance it is true, even though Palin has denied it. “Carly” Cameron of Fox News was, oh, so, a-twitter to report it to begin with, using an anonymous source. Anonymous source? This isn’t about some crime or felonious activity, it’s not Watergate, for goodness sake. It was gossip in the beginning and it remains gossip. But break it down, there were three points — three irrelevant points — something about Africa being a country, about not knowing the countries in NAFTA, and the clothes. None of it matters and never has there been any proof she said anything of the sort. Where is the proof? There are well upwards of 60 or more recorded verbal gaffes that Mr. Obama made during the campaign. And do we even want to get into Sarah Palin’s counterpart, Joe Biden, AKA the gaffe machine? There could have been an entire program devoted to them because some are quite humorous. Two that come to mind are Mr. Obama’s blunders about there being 57, maybe 58 states, and thinking Canada has a president. So, give me a break. CNN, MSNBC, and even FOX, because of this gossip reported by Carl Cameron, have lost all credibility with me. They all should really be ashamed of how they have let the people down during this election. During his campaign, Obama spoke of the Civilian National Security Force that he wants to be as strong, as powerful, and as well-funded as the U. S. Military. Here’s how it would work. Young people will know that between the ages of eighteen and twenty-five, the nation will enlist them for three months of civilian service. They’ll be asked to report for three months of basic civil defense training in their state or community, where they will learn what to do in the event of biochemical, nuclear or conventional attack; how to assist others in an evacuation; how to respond when a levee breaks or we’re hit by a natural disaster. These young people will be available to address their communities’ most pressing needs. Note the Circle of Love he speaks of. All is well.